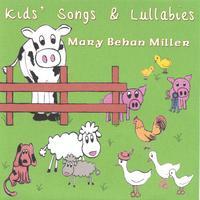 This children's CD features traditional songs perfomred with rich harmonies and interesting backing tracks. This CD features children's songs from the United States, Ireland, Scotland, Wales, England, France, and Germany. As with most of Mary's other CDs and Keltic Kaleidoscope CDs, Kids' Songs and Lullabies is available at the special 3 for $15 price. Special pricing information can be found in the links at the bottom of this page. Out of the 23 tracks on the CD, 12 songs are lullabies, which presumably should help infants go to sleep. A few of the lullabies, like the Skye Boat song and the Castle of Dromore, have a somewhat darker side in their lyrics but their wonderful melodies will be calming regardless. The other 11 songs are for children who are a bit older. Many of these tunes fall into the "silly song" category that strongly appeals to this age group. Some of the songs are even a bit educational since they involve counting. Another CD by Mary Behan Miller, "A Celtic Journey," has been released and is also available on CD Baby. As might be inferred from the title, the tracks on this CD feature traditional Celtic music. Additional tracks by Mary are available on two CD's also available here, "Some Keltic, Some Knot" and "Keltic Beginnings" as a member of the group Keltic Kaleidoscope. We have been looking for something to replace our daughter's music box to save on batteries so started looking for CDs. This one is perfect, she makes it to about song 15-17 and is usually out. Putting her to bed has never been easier!